A budget laptop that’s got it where it counts. 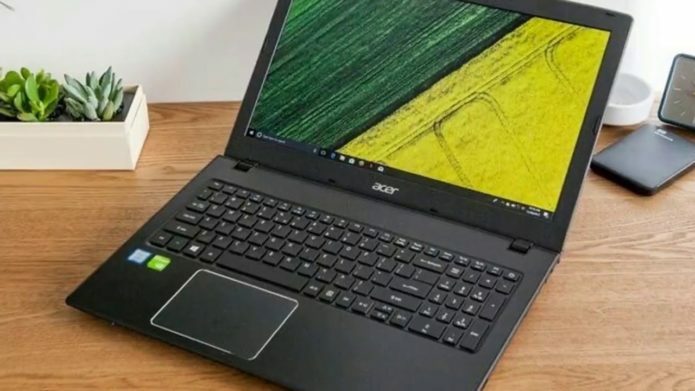 While it’s a couple of pounds too heavy to quality as an ultraportable, this $599 version of the Acer Aspire E15 will please bargain hunters looking for smooth Office performance, and it’s even got some game thanks to its discrete Nvidia graphics card. Yes, this mid-range model of Acer’s budget Aspire E15 line is a little thicker and heavier than an ultraportable, and we wish its 15.6-inch display were brighter. But for an affordable price (currently $600 on Amazon), it delivers supple performance courtesy of its quad-core, eighth-generation Intel CPU, plenty of ports for everyday users, a discrete graphics card for casual gaming, and even a DVD drive. That’s a great value, even if it means toting around a couple extra pounds. 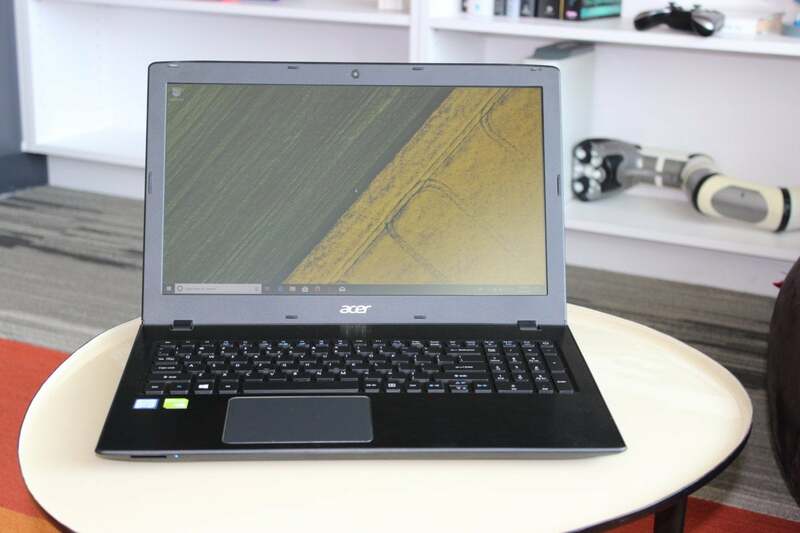 We tested the $600 version of the Acer Aspire E15 (E5-576G-5762), which packs in an 8th-generation, quad-core Intel Core i5-8250U processor, a 15.6-inch 1920×1080 display, 8GB of DDR4 RAM, a 256GB solid-state drive, a discrete Nvidia GeForce MX150 graphics card, and yes, an 8X dual-layer DVD-RW optical drive. That all adds up to a reasonably powerful productivity-minded laptop that can do a little gaming on the side. Measuring 15 x 10.2 x 1.2 inches and weighing in at a little under five pounds, the Acer Aspire E15 is too thick and heavy to qualify as an ultraportable, but it neither is it a behemoth. Indeed, the E15 fit comfortably into my 15-inch laptop backpack, and the weight was entirely manageable, although you’ll start to feel it once you toss in the 14-ounce AC adapter. 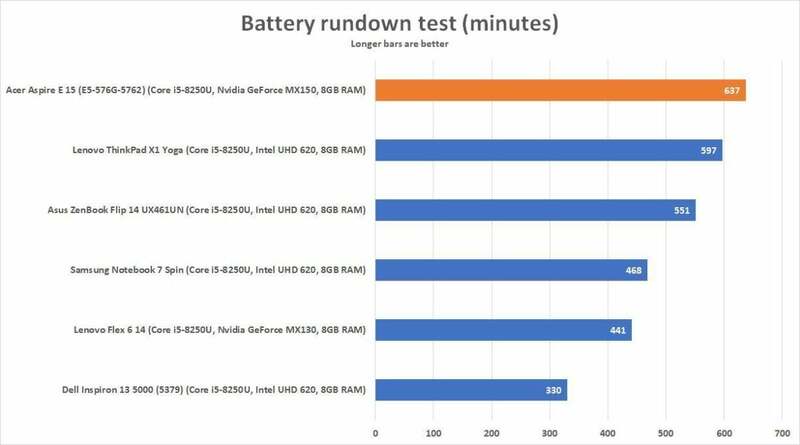 If you’re dead-set on an ultraportable system (as in three pounds or less) with an 8th-gen Core i5 CPU, you’ll have to up your budget by a few hundred bucks. 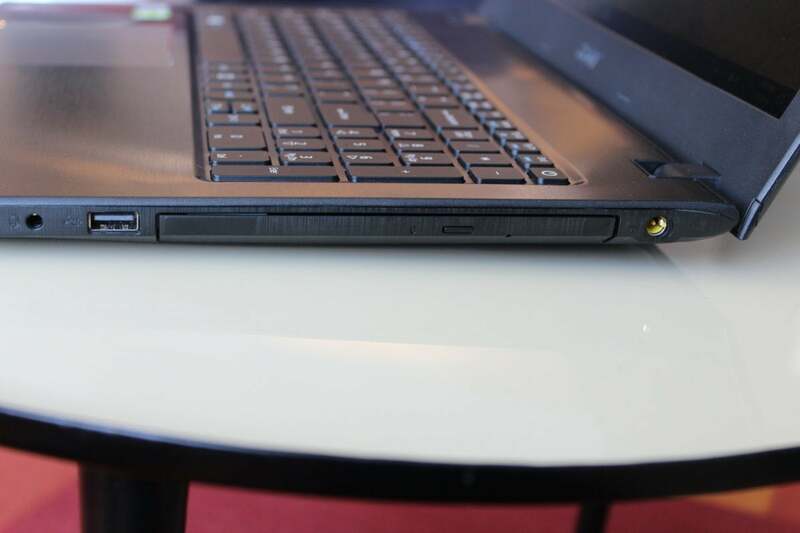 As with last year’s model, the Aspire’s tapered shell manages to make the laptop look thinner than it really is, while the matted lid looks relatively sleek and professional. The E15’s plastic exterior is a bit bendy in places but overall feels reassuringly sturdy—well, except for the flimsy slide-out DVD tray, anyway. 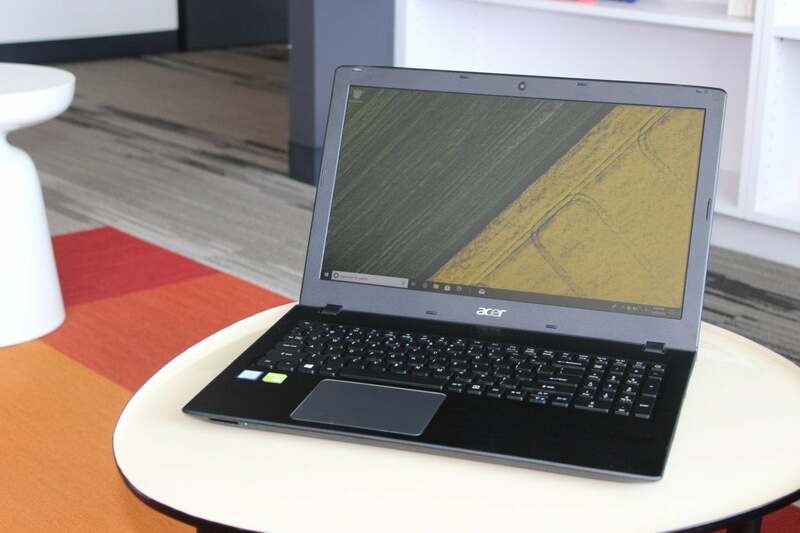 First, the bad news: The 15.6-inch display on the Acer Aspire E15 is disappointingly dim. We registered only 227 nits (or candelas) in the center of the screen, which is well below the 250 nits we recommend for comfortable indoor viewing. Just to be clear, the E15’s screen is, in fact, perfectly viewable in an office setting or a den, but expect to squint if you’re using the laptop outdoors or near a bright window. 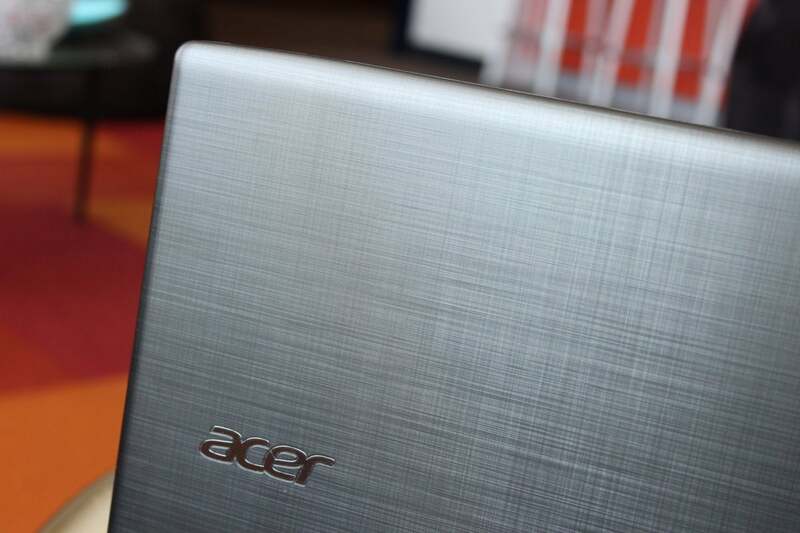 The Acer Aspire E15’s IPS display is too dim for our taste, but at least it looks good from an angle. The good news is that under the right conditions, the Aspire’s full-HD display looks sharp, boasting vivid colors and decent contrast for a budget laptop. Viewing angles on the E15’s IPS-technology panel are also solid, with the screen brightness and contrast looking pretty even up until the 45-degree mark. The display dims relatively quickly when tilting the lid up or down, although I didn’t notice any inverse colors you’ll see on non-IPS displays (such as on the cheaper Core i3 version of the E15). The Acer Aspire E15’s backlit keyboard felt relatively snappy and responsive to my fingertips, with the slightly concave keys serving up a tactile bump halfway through each keystroke. The main keyboard feels roomy enough, making for easy discovery, but the dedicated 10-key numeric keypad looks a little squished. And if you tend to pound the keyboard as you type, you may notice a little bendiness in the middle of the keyboard. 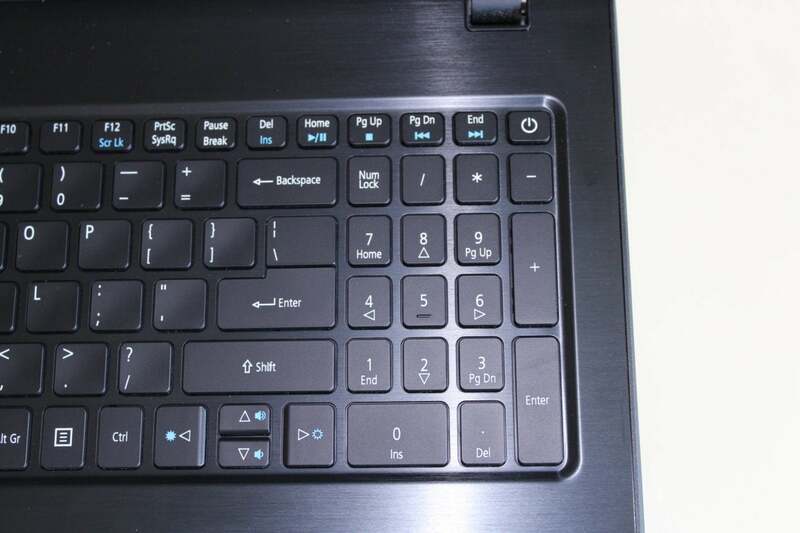 We enjoyed typing on the Acer Aspire E15’s snappy keyboard, but the 10-key numeric keypad looks a little squished. Centered directly below the main keyboard (and therefore sitting left of center due to the numeric keypad on the right), the Aspire E15’s trackpad felt smooth and responsive, with little in the way of mistaken inputs from my palms. The trackpad itself requires a fair amount of pressure to click, but that’s pretty much par for the course. You won’t find any fancy Thunderbolt 3 ports in Acer’s Aspire E15, but everyday users will find a pleasing grab-bag of old and new, starting on the left side with a USB 3.1 Type C port (up to 5Gbps), an ethernet jack, a VGA port, a full HDMI port, and a pair of USB 3.0 Type A ports. Also on the left side: a Kensington laptop lock. The Acer Aspire E15 lacks premium ports like Thunderbolt 3, but if you need a VGA port, you’re in luck. Behold, the Acer Aspire E15’s DVD drive, a rarity in laptops these days. 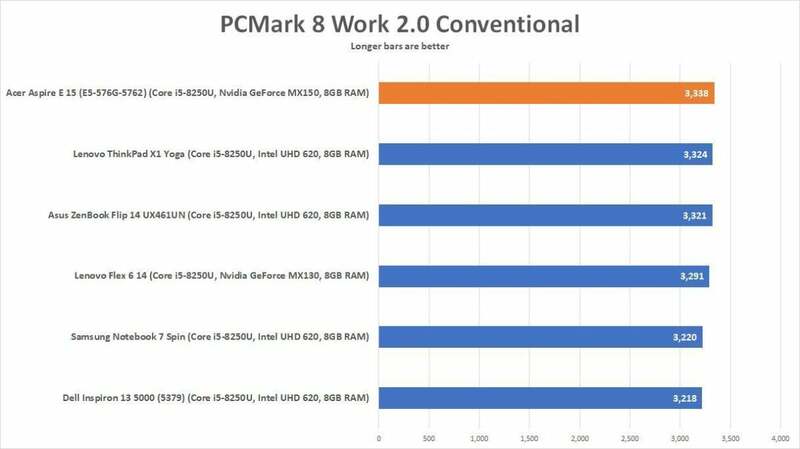 Generally speaking, a PCMark 8 Work score north of 2,000 means a laptop can run Office and similar productivity apps without breaking a sweat. 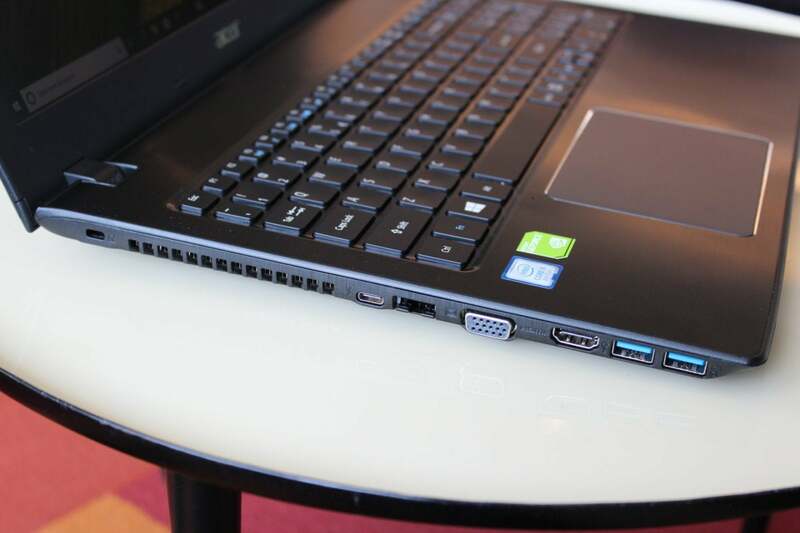 The Acer Aspire E15 easily cleared that mark, landing right in the range we’ve seen from other 8th-generation laptops. Our real-world E15 use reflected that score: Windows, menus, and apps opened and responded with plenty of pep, while the Windows toolbar search box never had to play catch-up with my typing. 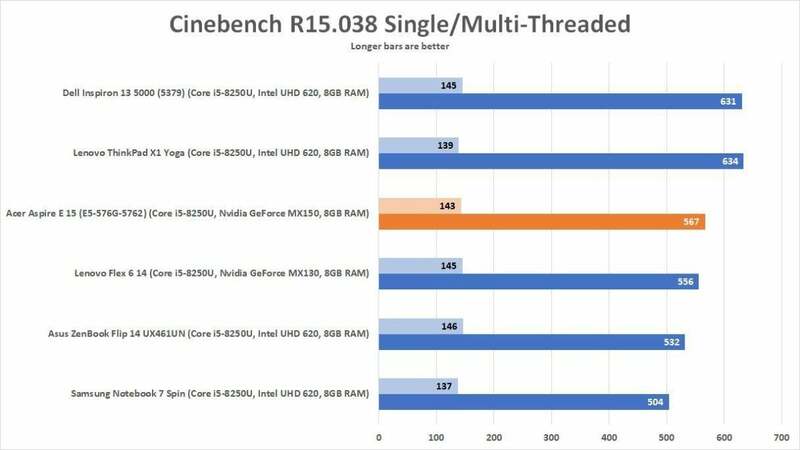 Now, it’s unfair to expect visual miracles from the E15, given that the MX150 is an entry-level graphics card intended only to give a modest graphical boost to mainstream laptops. 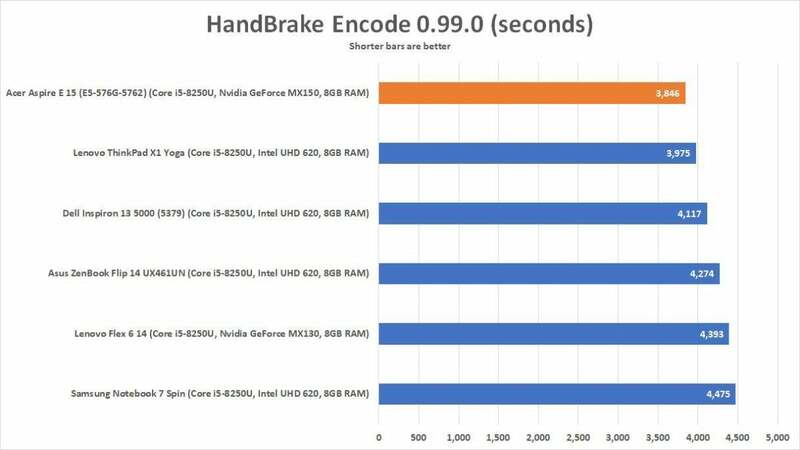 But it’s important to see how much of an advantage a discrete GPU can provide compared to similarly configured machines with just integrated graphics. It isn’t just what you have, but what you do with it, that matters. Lenovo’s Flex 6 14 brings up the rear of this group, even though it has a discrete MX130 GPU. 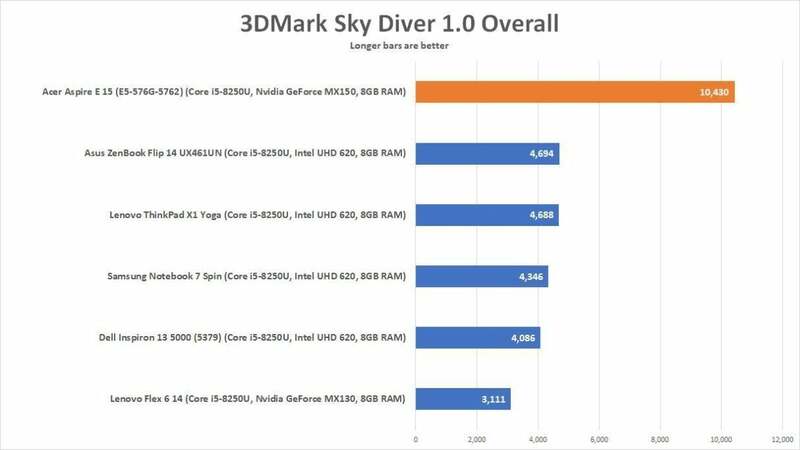 Because it’s a convertible, it struggles with thermal management, to the detriment of graphics performance. While it’s a couple of pounds too heavy to quality as an ultraportable, this $599 version of the Acer Aspire E15 will please bargain hunters looking for smooth Office performance. It’s even got some game thanks to its discrete Nvidia graphics card.